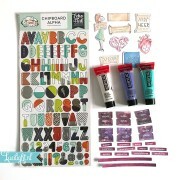 Een mooie set van Docrafts Papermania met papier met metallic effecten. Mooie gouden elementen, zilverfolie details en prachtige patronen. 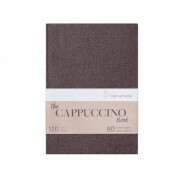 Dit A4 pakket bevat 48 vellen waaronder: 22x A4 papier, alphabet stickers, randjes, gestanste strikjes, envelopjes, tags, vlaggetjes, journaling kaartjes en 8 A4 vellum sheets met mooie opdruk. 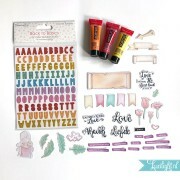 Docrafts Papermania brings you CAPSULE ELEMENTS, a brand new Capsule Collection. This second collection ELEMENTS METALLIC features stunning gold and silver foiled textures and surfaces in striking contemporary patterns. This A4 Ultimate Die-cut & Paper Pack contains 48 papers which include: 22 x A4 Papers, Alphabet Stickers, Borders, Bows, Memory Pockets, Mini Envelopes, Boxes, Tags, Bunting, Journaling cards and 8 A4 Vellum Sheets.